This was taken outside Ulster Bank on Patrick Street. The clampers had just loaded up a car. Nice to see that the rules don't apply to them. Clampers with out of date tax Originally uploaded by despod. Posted by Des at 2/08/2007 05:41:00 p.m. The best one I heard was a plain clothed Garda writing a ticket for a clamper illegaly parked while he clamped the Guards car. It was a bit like that standoff scene in Reservoir Dogs. 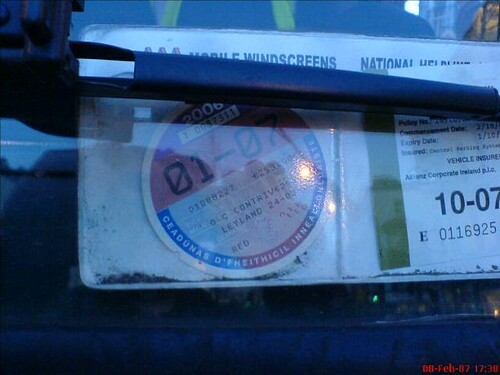 I betcha the tax disc is in the post. Gammagoblin, would have loved to see that one although I'd say the tax-payer paid to get the more expensive clamp off!